The raised tankard has tapering sides and is covered with a flat lid having a serrated lip and an applied, drawn, molded base. A tall, scrolled thumbpiece is soldered to the lid and descends to a five-part hinge and flattened baluster drop on a seamed double-scroll handle terminating in a scroll. An added spout was removed at an unknown date. John Brevoort established himself as a silversmith of rank in eighteenth-century New York. The son of Elias and Margaret (Sammans) Brevoort of New York, he was baptized on September 18, 1715, in the Reformed Dutch Church of New York City. His master is unknown, but by 1739, shortly after he would have completed his apprenticeship, he married Louisa-Abigail Kockerthal (1710 – after 1775), daughter of the Rev. Joshua and Sybilla Charlotta Kockerthal. Brevoort was admitted freeman on November 23, 1742. His good standing within the community, which included English patrons, may be inferred from the 1757 marriage of his daughter Charlotte (1740 – 1790) to Whitehead Hicks (1728 – 80), who served as New York mayor from 1766 to 1773. Tankards and teapots by Brevoort survive, along with sugar bowls, spoons, and at least one covered porringer. Membership in the Collegiate Reformed Protestant Dutch Church provided him with the opportunity to produce three particularly ambitious tankards, each bearing the elaborate arms of the corporation but otherwise executed in a plain style similar to both the tankard seen here and another made for his father-in-law. The presence of Brevoort’s mark on an older porringer by Jacobus van der Spiegel (1668 – 1708) may indicate that Brevoort traded in or repaired older silver. A collaboration with Thauvet Besley (d. 1757), his contemporary, may be inferred from a porringer bearing their marks and formerly owned by Almy Townsend Hicks (1795 – 1862), Brevoort’s granddaughter. 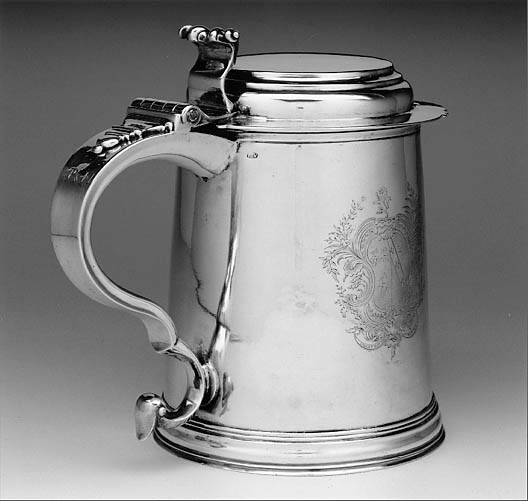 The florid, rococo-style Greene-Charnock arms are not clearly understood in light of the tankard’s history of ownership, which lacks an association with the Charnock family. They may indicate the somewhat idiosyncratic choice of heraldic imagery found on American silver. 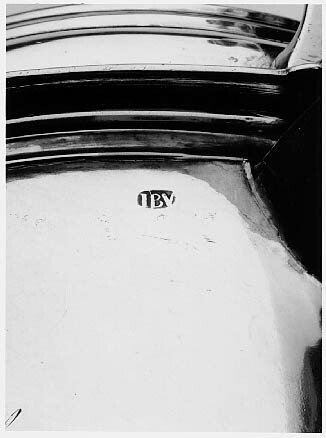 On handle, "P * M" is engraved in shaded roman letters. 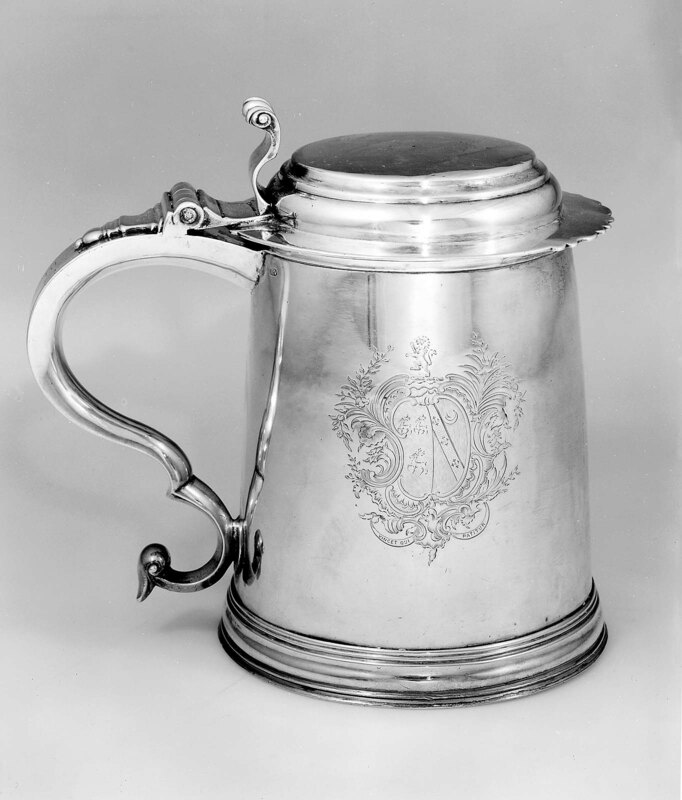 On body of tankard, to right of handle, the Greene/Charnock arms are engraved in a scrolled, foliate cartouche, with the Latin text "VINCET QUI PATITUR" [He who suffers, conquers /or/ He who conquers, suffers] appearing below. A later dedicatory text in script reads "Louisa Bronson Hunnewell / from her / Great Great Aunt / Louisa Troup / March 1882." 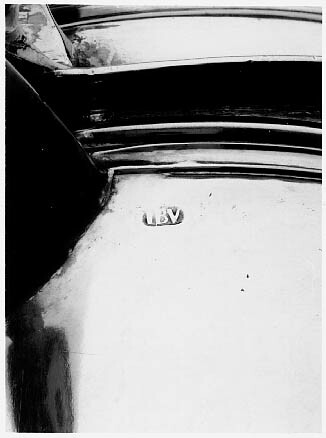 "IBV" is stamped in an ellipse to left and right of handle, below rim. The tankard’s history is complicated. It appears that the Greene family of Rhode Island were early owners and accounted for half the vessel’s heraldic arms. The first owner was likely Gen. Nathaniel Greene (1742–1786) of Newport and Katharine Littlefield (1755–1814) of New Shoreham, Block Island, Rhode Island, m. 1774. War-related debts forced Greene to sell most of his Newport property, and about 1785, a year before his death, the family relocated to Mulberry Grove, Cumberland Island, Georgia. The later initials “P*M” coarsely engraved on the handle may be those of Phineas Miller (1764–1803) of Middletown, Connecticut. The son of Isaac and Hannah (Coe) Miller, he briefly attended Yale College and later became a tutor to the Greenes’ children. Miller remained with the family as manager and married Greene’s widow in 1796. 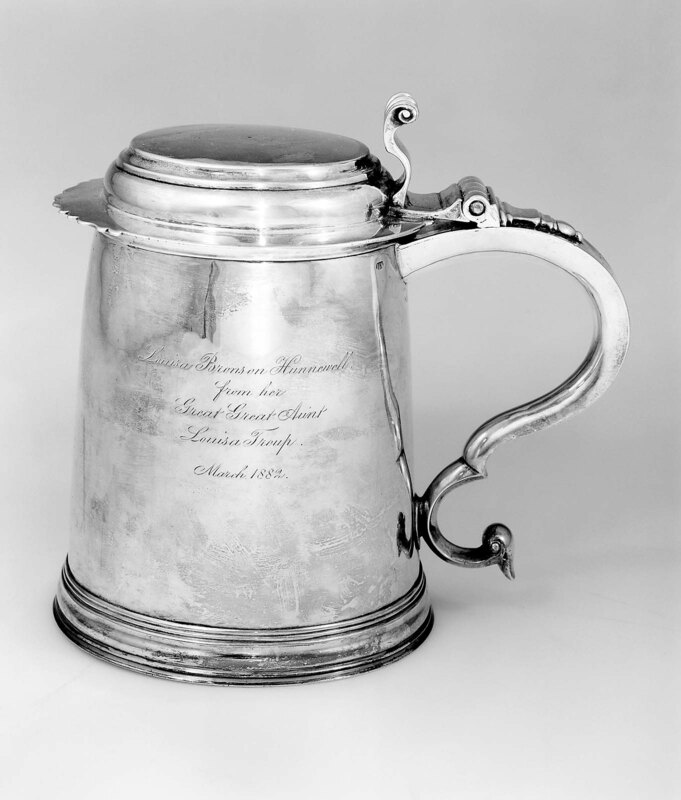 The tankard passed to Martha Washington Greene (b. 1777), daughter of Nathaniel and Katherine Greene and wife of John Corlis Nightingale (b. 1771), m. 1795; to their son Phineas Miller Nightingale (b. 1803) and his wife, Mary King (about 1810–1894), m. 1836; to their daughter Mary Ray Nightingale and Robert Troupe (d. 1874), m. 1866. Subsequent history in the Troupe family is unclear, but the tankard was apparently transferred cross-generationally to Louisa Troup (b. 1791), the unmarried daughter of Lt. Col. Robert Troupe (1757–1832) and Janet (Jennet) Goulet (b. 1758). It is Louisa Troup’s inscription, which includes the incorrect phrase “great-great aunt,” that appears on the tankard to her grand-niece Louisa Bronson (1843–1890) of New York. Louisa Bronson was the granddaughter of Louisa Troup’s sister Charlotte Troup (b. 1792), who m. James Lefferts Brinkerhoff (b. 1791) in 1815. Louisa Bronson was the daughter of Charlotte Brinkerhoff (1818–1861) and Frederick Bronson (1802–1868), m. 1838. Louisa Bronson m. Hollis Horatio Hunnewell (1836?–?1884) of Wellesley, Massachusetts, in 1867; the tankard descended to their son Hollis Horatio Hunnewell Jr. (1868?–?1922) and his wife, Maude Somerville Jaffray (b. 1871); thence to their daughter Louisa Bronson Hunnewell, who m. diplomat Franklin-Mott Gunther (1885–1941) in 1918. To her cousin Charlotte Winthrop Cram (b. 1893), daughter of Charlotte Troup Bronson Winthrop (1865–1893) and Henry Spencer Cram (1852/3–95). Charlotte Winthrop Cram m. Robert Ludlow Fowler Jr. in 1914. To their daughter Angela Fowler (1915–1989), the donor, and her husband, Craig Wylie (1908–1976), of Cambridge, Massachusetts.